What do you think the title The Peach Keeper means?Who is the peach keeper in the story? Superstitions played a big part in Willa's grandmother's life, and in Willa's life, by extension.What superstitions did you grow up with?Why do you think superstitions exist? Several of the characters in The Peach Keeper struggle with how people used to see them as opposed to who they are now.Who were you in high school?Do you miss that person?Or are you glad to leave that time in your life behind? Willa spent her formative years as The Joker, acting out and sparking controversy that she wouldn't become aware of until she was an adult.What do you make of her past actions?How does it connect to the way she acts in the novel? How does it affect her relationships as an adult? The characters in The Peach Keeper live in an extraordinarily beautiful area, one surrounded by waterfalls.Yet Willa once remarks, "When you see it every day, sometimes you wonder what the big deal is. "Do you think you get so used to beauty that you stop seeing it?What are some natural wonders in your area?Does Willa's comment also refer to people? The Blue Ridge Madam takes on a life of its own in the novel, becoming much more than a building.What do you think it represents for the town? For Willa and Paxton? There's a wisp of something supernatural following the characters in the story, seemingly brought into their lives by the discovery of buried bones under a peach tree.What are your thoughts on the supernatural?Do you think disturbing a grave upsets the spiritual side of things?Have you ever had a paranormal experience? One of the prevailing themes in The Peach Keeper is friendship.Agatha and Georgie are elderly, and have been friends all their lives.Paxton and Willa have a newly formed friendship.The book posits that friendship is "a living breathing thing, something that comes to life the moment it happens and doesn't just go away when it's no longer acknowledged. "If there is no big break-up, just a gradual separation, do you think the friendship still exists?Do you think once you are a friend, are you always a friend?Have you ever reconnected with an old friend and found that you still share a bond with them? 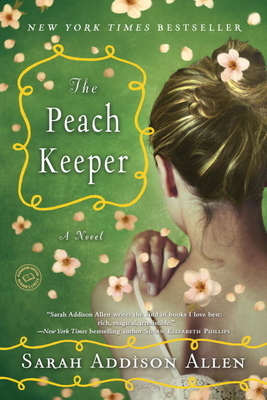 Sarah Addison Allen's books usually have themes of forgiveness and food.Have you read Sarah's other books?How is The Peach Keeper similar?How is it a departure?Did you recognize the reference to the main characters in her debut novel, Garden Spells? Paxton, Willa, and even Willa's father, deal with parental expectation.Do you think that who we become in life is due in part to what our parents wanted us to be, or who are parents were?If you have children, how do they fit the pattern? How do you take your coffee?Do you think that says something about you?Do you believe, like Rachel, that how someone takes their coffee says something about their personality? What do you think of Paxton and Sebastian's relationship, and how it evolves over the course of the novel?Have you ever had a similar relationship in your life? How do you feel it fed into the overall themes of The Peach Keeper? Willa and Colin have a complicated relationship from the start - what do you think is the strongest force pulling them together?Do you think their relationship would have worked had they met in another time and place? In the end, Agatha keeps a secret she promised to keep seventy-five years ago. In this information age, we are not a private society.How hard is it to keep secrets?Would you be capable of keeping a secret that long? The theme of roots runs through the novel - from the peach tree, to Colin's work, to the characters struggling with their place in Walls of Water.What about the town and its history draws people to it and entices them to put down roots?On the flip side, what about it causes others to deny their roots and move away?Have you had a similar experience with your home town?